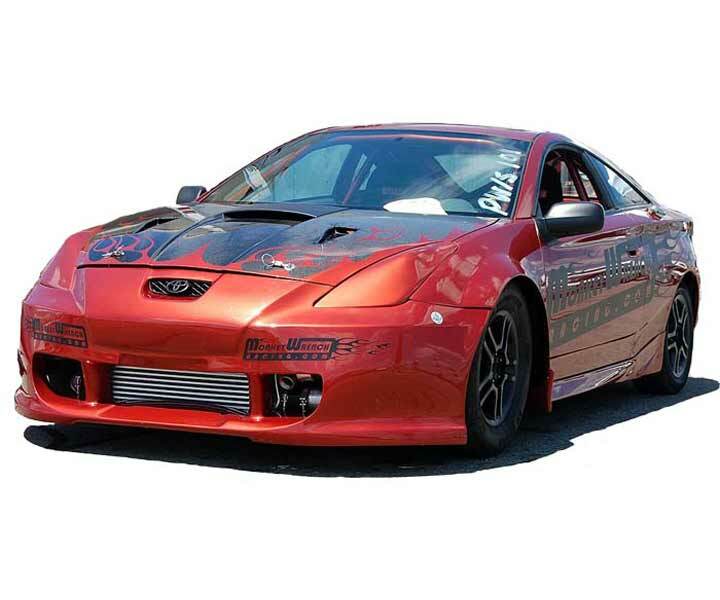 MWR LSR Celica – World’s most powerful 2ZZ-GE engine! 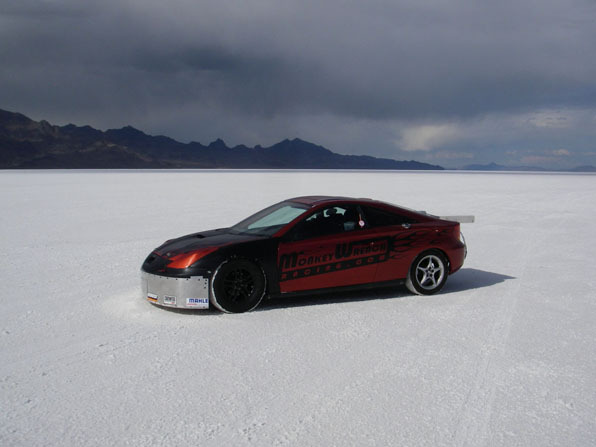 When participating in Speedweek at Bonneville, we met the guys from “Option” the Japanese Car Magazine. A couple of weeks ago, we received a copy, and we were in it! Here is the scan from our copy, since we know most of our customers can’t get this cool magazine. 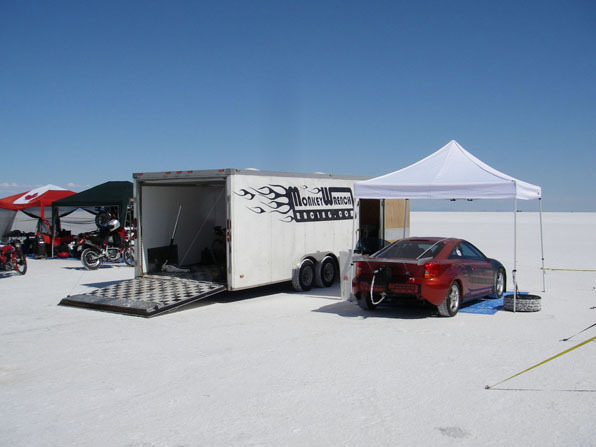 Speedweek at the Bonneville Salt Flats.Earlier this year I took a long hard look at the rules and we started construction. 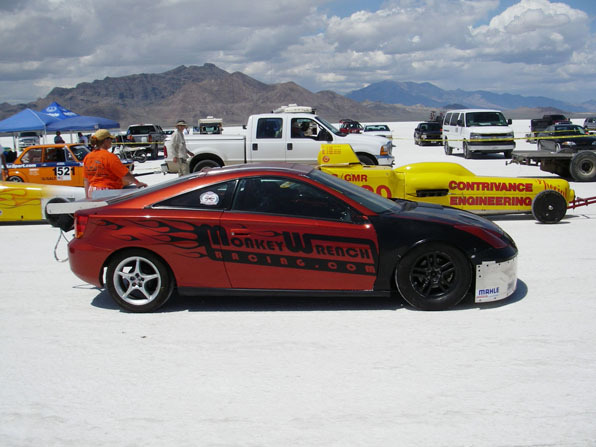 Lots and lots of changes to the MWR drag Celica, most of them safety equipment. It now has a full head restraint seat, twin fire systems, roof rails, door net, etc. I now wear a fire suit thicker than anything I’d wear in winter- same suit the top fuel drag racers wear. 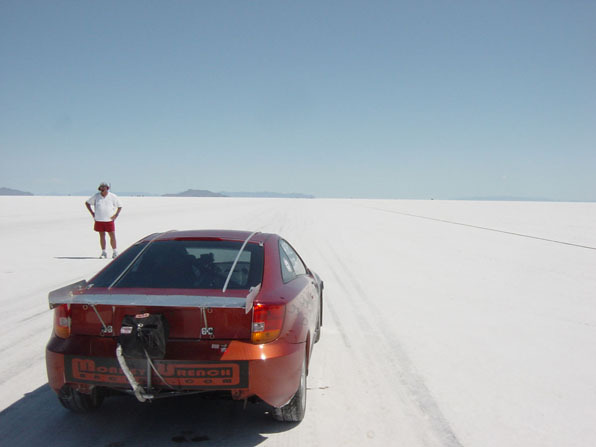 Looking at the records we decided that for the first year while we’re sorting out the car and learning how to drive on salt it’d be best not to be going 250mph. A smaller displacement class would be best. I built a very special short stroke 1.5L 2ZZ engine. This thing is incredible. Along with an upgraded prototype turbocharger it makes about the same power as the 1.8L we ran last year. Turbo spools a little slower but it pulls strong to 9500rpm+. It has about 550whp at 26psi and would make about the same 666whp the 1.8L engine made at 33+ psi though we did not have time to make any very high boost runs on the dyno before the event. 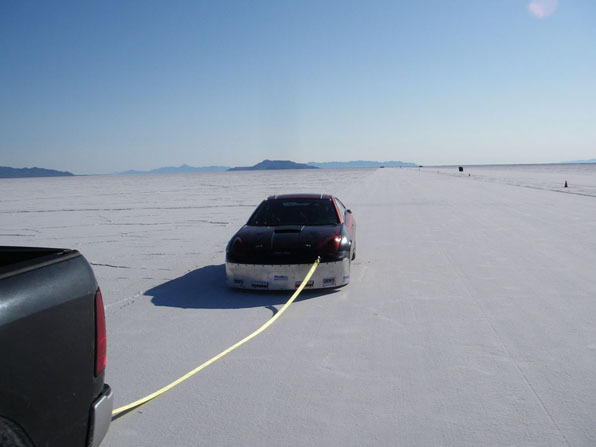 So we headed out to Bonneville (28 hour tow!) and got set up. It was an adventure getting through tech. 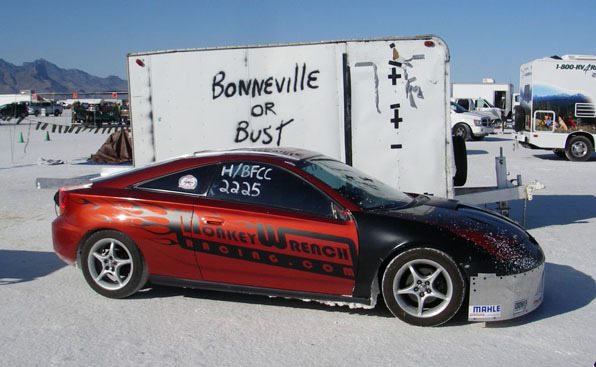 The Bonneville guys love to haze newbies especially those not from SoCal but they’re good guys. We made it through (with some minor changes) because we made sure to follow the rule book to the letter. The only thing we did not have for this year is the special 300mph tires that many cars run. They cost over $500 each and are tough to come by so we left those for next time. Because of that we were not permitted to make any timed runs over 200mph. On course, the salt took some getting used to. Launch, wheelspin, shift, wheelspin, shift, wheelspin, shift, wheelspin, shift, wheelspin, shift, grip!! The car went dead straight and behaved beautifully. The parachute which has to this point been for decoration only did a fantastic job of stopping the car from 200+ mph with no drama despite the slippery surface. All rookies are required to make a slow pass first and work up to faster passes. 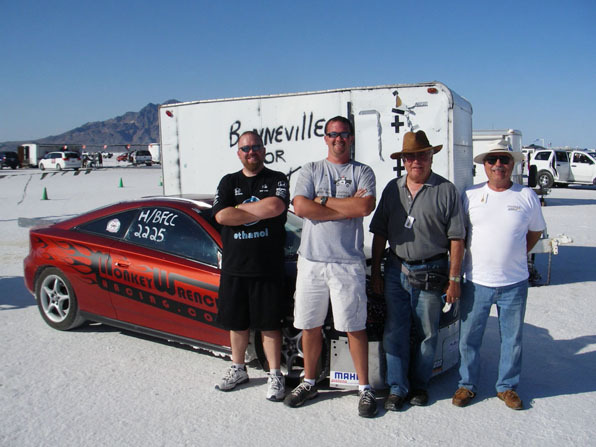 The car did great on runs at 150mph and 175mph. After that we were legal to go up to 200. Next run the car was humming along very strong when all of a sudden silence! What happened?!? 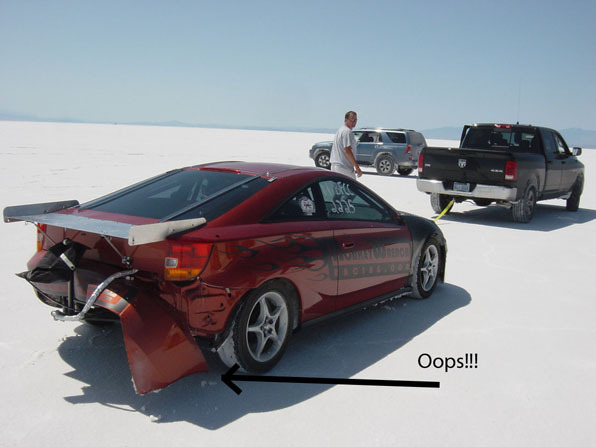 At first I thought we lost the engine but after looking things over I found that the rear bumper had actually ripped halfway off at 194mph. It was attached using stock hardware which apparently is not nearly enough. When it came loose it disconnected our shutoff switch which shut the car down. No harm done. Next run with the bumper securely bolted on the car was amazing. It accelerated hard to 195mph then I dialed the boost back to only 16 psi and drove for a couple of miles at a steady 200mph. The car ran cool and smooth. We qualified for a land speed record in our class, beating the previous record by about 40mph! This is the team. A couple of young guys and a couple of old veterans who are good friends of the shop and who were invaluable in figuring out the procedures and requirements. We couldn’t have done it without them. Already we were very pleased with how things were going. Some people show up and don’t get to run at all because of the insane amount of safety equipment and little technical details. Some people show up with a car that won’t run strong or straight or safe. Our car was out there making run after run without drama. Our next run was unfortunately our last. The engine took off ok and the car was running great but partway through the run the engine started making a bit of noise. I shut it down as a precaution. 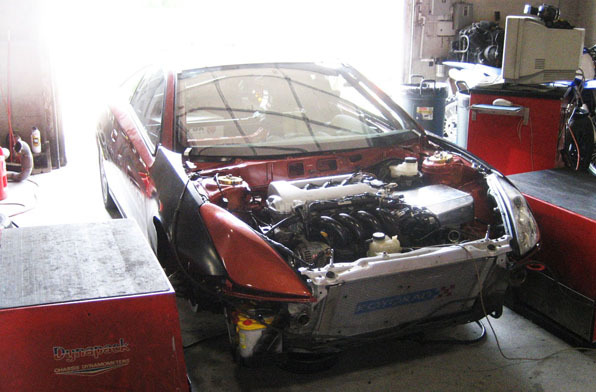 This car has a very unique engine mount setup and because of that we were unable to run a Moroso pan. Clearance issues to frame, belly pan, etc. The long hard deceleration with the parachute deployed is like nothing I’ve ever experienced in a race car and is evidently more than the stock oil pan can handle. I believe we starved the engine briefly of oil while slowing from 200mph on the previous run. Bummer. Overall a great trip. The car is solid and smooth and drives great. The tiny engine made great power and held together just fine at full throttle despite spending miles at a time well over 9000rpm. 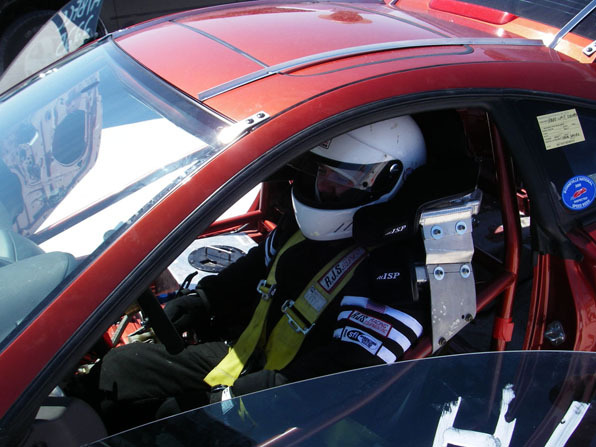 We didn’t get any official times over 200mph but I’ll just say the car proved itself very comfortable up in that range. Running the numbers it appears that the car is capable of around 235mph at high boost. 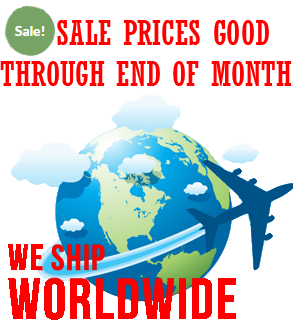 I’ve now purchased a set of 300mph tires and am working on getting even more power out of that tiny engine. 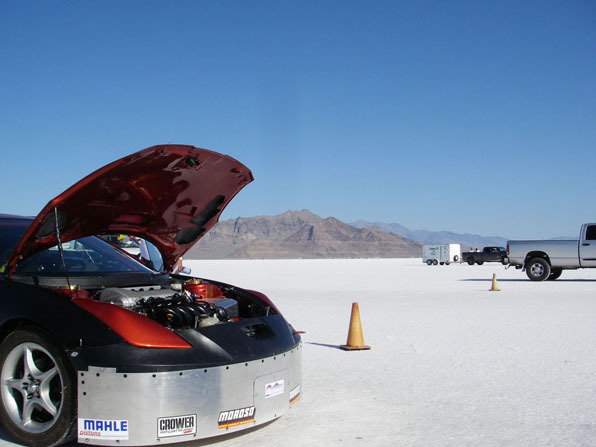 Not sure if we’ll make it back to Bonneville this year but we’re also considering Maxton which is a 1-mile drag race in North Carolina. The car would do great at either event. We’re psyched. 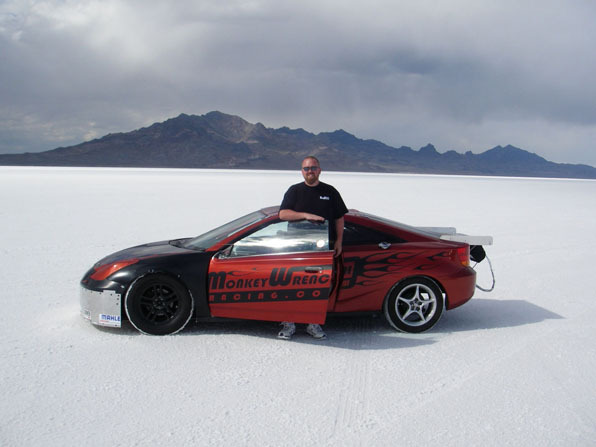 If you would like to have your car considered for the Monkeywrench customer of the month, please send an email to [email protected] and include as much as possible about your build including pictures, dyno sheets and timeslips when possible.